“We are very inspired with Hilary Clinton’s many achievements and contributions. It is an honor to have created this special recognition and commemorative rose,” stated Sid Fey, CEO, Sid Fey Designs, home of LoveIsARose.com. This real, preserved 24k gold rose pays tribute to Hilary Clinton, nominated by the Democratic Party for President of the United States. 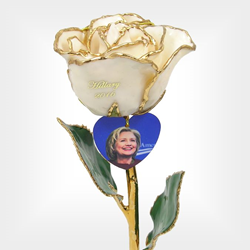 The petal of the flower holds the words “Hilary 2016” and a Heart Charm attached to the rose is adorned with Clinton’s photo making for a very personalized gift available at LoveIsARose.com. Hilary Clinton is the first female candidate to gain the status of presidential nominee in a major American political party. Clinton’s major accomplishments include serving as the 67th U. S. Secretary of State, U. S. Senator representing New York, First Lady of the United States and the First Lady of Arkansas. “We are very inspired with Hilary Clinton’s many achievements and contributions. It is an honor to have created this special recognition and commemorative rose,” stated Sid Fey, CEO, Sid Fey Designs, home of LoveIsARose.com. LoveIsARose.com, known for their custom, personalized gifts including gold roses with custom messages imprinted on the flower petals, also features a unique line of preserved, real orchids and lilies. The distinctive flowers are carefully selected and picked at the peak of their beauty, then preserved through a 65-step process and then trimmed, or dipped entirely, in 24k gold, platinum, or silver. The roses are available in an array of colors to suit every occasion. Capodimonte porcelain roses and special occasion shadow boxes are additional finds at LoveIsARose.com. The shadow boxes display the gold roses or orchids and can be customized to deliver a special message to celebrate a love relationship, Mother’s Day, anniversary, wedding, birthday, Christmas, Valentine’s Day or even the new baby in the family. Laser-engraved onto bronze plates, messages of love and favorite photos adorn the rich, velvet lined, shadow boxes. LoveIsARose.com is also home to Birthstone Family Trees. Family names and birth dates are etched in brass or pewter, or displayed around three-dimensional, artfully created wrought iron trees. Vibrant birthstones then become the treasures decorating the branches. There are framed and table-top designs. The family trees are given to parents, grandparents, husbands, wives, and employers. “Our mission has been, is, and will be to celebrate family and relationships. We love creating new gifts that give our customers the opportunity to honor the people they care about,” added Fey. “Do you have a favorite candidate? Send us a photo and we will make a special rose for you,” concluded Fey. Sid Fey Designs creates unique, personalized gifts that celebrate relationships, love, and family. These custom products are marketed through two successful websites, LoveIsARose.com and BirthstoneTree.com. Sid Fey, CEO of Sid Fey Designs, has been a successful entrepreneur in both retail and the manufacturing sector for over 40 years. Fey has created many products over the last several years that are being marketed throughout the world. Fey is also the author of the book The BEING Game: For the Love of Your Life.